Why Is Single File Aligned Water So Important to Health? Why Is MRET / Single File Aligned Water So Capable of Improving Health? The simplest answer is that Single File Aligned Water hydrates the cells faster and more completely than normal water. Water brings nutrients into and takes wastes away from, cells. Due to Dr. Peter Agre Nobel Prize winning science, we now know that for water to go inside our cells it has to be single filed aligned. 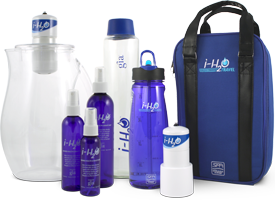 Animation Video - Why Does the i-H2O Single File Water Alignment Activation System Work? Below: Animation Video - How Does the i-H2O System Work? If you want to stay young as long as possible, you must do all four of the things below. The first three you probably understand, but the fourth is new. Stop free radical damage with antioxidants and regular detoxification. Stop glycation damage by keeping Blood Sugar, Leptin and Insulin Levels low. Prevent muscle and bone wasting by engaging in frequent weight-bearing exercise. Maintain a flow of pure water through one’s cells by drinking Single File Aligned Water (it is not enough for water to go through the kidneys, it must go through the cells, and Single File Aligned Water helps that cellular flow to happen really well). Interestingly, flowing water keeps the body pure... keeps nutrients going into cells and wastes coming out... if you don’t keep this water flow going, eventually, your cells will stagnate. i-H2O/MRET water causes plants to grow faster and skin to have less wrinkles. While the one-off experiences shown here are not conclusive, double-blind, studies... they are quite interesting. The Power of i-H2O/MRET water to hydrate materials is demonstrated with contact lenses and water beads. Interesting experiments because it demonstrates real world capabilities for i-H2O/MRET water to super-saturate materials which are unaffected by ordinary water. Drinking Single File Aligned Water is the Newest Anti-Aging Discovery!